Home Birth is an unforgettable...rewarding experience...A whole new outlook on the MIRACLE OF LIFE! CELEBRATE THE GIFT OF LIFE! I Thank God for Psalm 139..."You are the one who put me together inside my mother's body, and I praise you because of the wonderful way you created me. Everything you do is marvelous! Nothing about me is hidden from you! I was secretly woven together in my mothers womb, but you saw my body being formed. Even before I was born, you had written in your book everything I would do." Our God is an AWESOME God! The first six of the Scheffler Children were ALL born at Central Dupage Hospital in Winfield, IL. Each of the births were between 2 and 3 weeks late, resulting in the induction of labor through pitocin. Each labor was accompanied by an epidural at 4cm for pain and being attached to fetal monitors, blood pressure equipment, not being able to go to the bathroom unattended, not eating and being confined flat on your back in bed. It made having a baby seem like an illness not a labor of love, joy and excitement. When we became pregnant with number seven Shari began searching her options of a home birth. She was convinced that after all the inductions God made her body...wasn't God able to help her deliver a healthy baby without intervention? Bob was a bit more apprehensive about the Home Birth alternative. He felt Shari needed her epidural. Shari thought the same thing, so she continued her research. Finally after 4 months of research Shari found Homefirst in Illinois. They have been delivery babies at home for over 20 years. Shari read and read and finally decided to schedule an interview with the Homefirst physicians. Bob accompanied Shari to the interview. They answered all their questions about drugs and safety and relieved any fears about delivering a baby at home. At each pre-natal appointment Shari became more convinced she was doing the right thing. Baby #7 was due October 24th. On October 17th, a week early, much to Shari's surprise she went into labor on her own. The stress about finding someone to watch the other six, making it to the hospital, having a private room, not being hooked up to all the equipment, not having her blood pressure taken every 3-5 minutes, being able to go to the bathroom on her own, eating and drinking whenever, being able to walk around, all that made Shari feel so relaxed that the stresses of delivery were gone. Knowing she would be in the comfort of her own home in her bed, surrounded by the people she loved made labor and delivery so much easier. In fact, the pains of labor never went past the intensity she felt in the hospital before the epidural. The labor and delivery nurse arrived within 15 minutes of calling and stayed at the house through the whole delivery. The doctor was called at the perfect time, arriving about 30 minutes before the actual delivery. The whole family was able to participate in the birthing process. One sibling video taped, one held mom's hand, another rubbed her head, still another fed her crackers, and others just played on the floor. Once the baby was born, Shari was cleaned up (including the bedding) in a matter of minutes Shari was peacefully sitting in her rocker, in her bedroom suite in the comfort of her own home nursing her newborn. The family was right in the room with mom comforting and congratulating mom and dad and enjoying their new baby. The comfort, care and love of having a baby at home is more rewarding than words could ever express...in fact after the joyous experience of the first home birth, baby # 8 and baby #9 resulted in Home births through Home First in Illinois. In fact baby #9 was conceived in New Hampshire, but born at Grandad and Grandma's home in 2004 in Illinois through Home First. Once you have had a home birth there is no turning back. 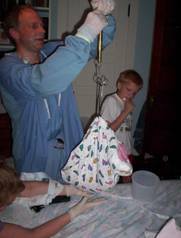 On October 19th, 2007 we experienced our first home birth in Colorado. Adam Joshua Scheffler was born at home with Colorado Springs Midwife, Laura, attending the birth.